But then, you come to the realization that you and your spouse have yet to discuss what will be done about the retirement plan(s). Whether or not it’s your retirement plan, you feel entitled to some form of financial protection in your elderly days, and thus your desire to maintain at least some part of this benefit is quite profound. However, you recognize that retirement plans might not be the easiest entity to divide during the divorce process, especially given the fact that they are considered to be protected assets under federal law. And now, all of the sudden, you feel overwhelmed once again. I’m here to assure you that the process of dividing the retirement plan is not as overwhelming as it may seem. This is because you are not the one who is responsible for this particular process. And ultimately, neither is your spouse. The only thing you and your spouse need to negotiate is how the particular plan will be divided in your settlement agreement, either on a percentage basis or transfer of a particular dollar amount from one spouse’s plan to another retirement plan in the other spouse’s name. It is very important for both you and your spouse to know that the division of your retirement plan is a routine part of your divorce process, one that must be handled by a QDRO professional or service who specializes in the drafting of these orders.. Whether you have been handling your divorce in the courtroom, in mediation, or by yourselves, the divorce process should not be fully completed until this professional writes up the QDRO which will explicitly state how the retirement plan(s) will be divided. So please… do not let this aspect of the divorce stress you out. Just do yourself a favor and continue reading on so that you can find out exactly what needs to be done in order to draft a QDRO and divide your retirement plan(s) accordingly. 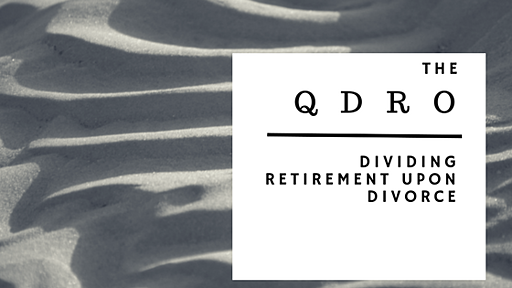 Why do I need a QDRO to divide my retirement plan during the divorce? Retirement plans are often considered to be an asset that cannot be accessed by anybody but yourself. For example, if you file for bankruptcy, creditors may take your house or your car, but they may not touch your retirement plan. The same precedent used to be true for retirement plans during divorce. However, after 1984, congress made an exception to this protected status for retirement plans, which permitted retirement plans to be divided between spouses during the divorce process, only if ordered by the court in a QDRO or some other type of Domestic Relations Order, as required by the particular plan. What exactly is a QDRO? 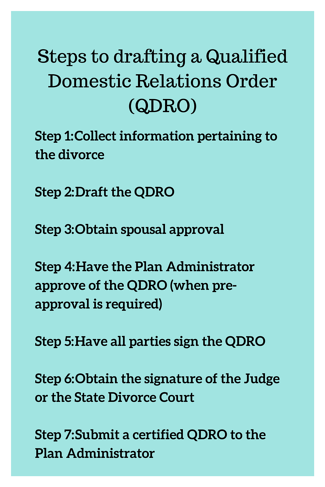 As previously mentioned, QDRO stands for Qualified Domestic Relations Order. The language of the order must be drafted to conform with the strict parameters and requirements of the particular plan, and will state how the benefits of the plan are to be divided or transferred from the plan of the “employee spouse” to the other spouse, known as the “alternate payee” in the divorce. A QDRO is required for most (not all) retirement plans under the federal Employee Retirement Income Security Act (ERISA). Can my spouse and I draft our own QDRO? You and your spouse should not draft your own QDRO. This is ultimately because the QDRO is a highly technical document and is very difficult to draft without experience and specialized knowledge in this area. The terms of the QDRO must be drafted in a manner that is consistent with the regulations and requirements of the particular plan involved. And because there are so many different types of retirement plans (ie: 401(K)’s, pensions, 403(B’s), stock ownership plans, etc. ), a qualified QDRO consultant who is familiar with each type of retirement plan must be employed to draft this specialized document. Is it possible that I might need more than one QDRO? Absolutely. When dividing retirement benefits, there must be a separate QDRO drafted for each and every retirement plan that the couple has access to in which a QDRO is required. How long does it take to draft a QDRO? If all involved parties cooperate and the process goes smoothly, then the QDRO can take anywhere between 1 and 4 months to be completed and pre-approved and signed by the judge for division. Because the process involves so many people including you, your spouse, your legal representation, a separate QDRO specialist, a plan administrator, and a judge, the timeliness of this process relies on everybody doing their job efficiently. Do either I or my spouse have to pay taxes and/or penalties once the plan is divided or transferred with a QDRO? No; one of the benefits of having a QDRO is that when it is drafted to divide or transfer funds incident to a divorce, and the division or transfer takes place, it becomes a tax and penalty-free event, with the exception that if the receiving spouse elects to take any amounts in cash at the time of the transfer, they will pay ordinary tax on the cash amount at their own tax rate. What happens if either me or my spouse dies after the divorce with a QDRO? This opens up a very complicated pandora’s box of issues to be aware of and is why this service must be left to a professional who is familiar with the specific options and parameters of the plan being divided. Most retirement plans have language and options around survivorship benefits if the employee spouse dies after the divorce, either before or after they actually retire. If they did die, would they designate their ex-spouse as the beneficiary on their plan or someone else, perhaps a new spouse, if they remarried? How would the benefit change as drafted in the QDRO? What happens if the recipient spouse dies after the divorce? What happens to their benefit under the QDRO? Is it forfeited back to the employee spouse or does it pass to the recipient spouse’s estate? These are all possible events that need to be discussed and negotiated at the time of the divorce between spouses. Therefore, having a clear understanding of how survivorship rights of an ex-spouse work and the available options under the particular plan is critical at the time that the QDRO is drafted. What does the process look like when drafting and finalizing the QDRO? What does a QDRO cost? The cost to prepare a QDRO will vary depending on the quality and extent of the service provided by the QDRO preparer, but a typical range may be anywhere between $300-$600 for each QDRO that is necessary for each plan. Again, if there’s one aspect of the QDRO that is most important for you and your spouse to recognize, it is that this document is not drafted by either of you. Because this document is prepared by a third-party professional, you and your spouse will not have much control over what the actual QDRO language looks like. Yes, you and your spouse do need to actually negotiate the terms of the division of the plan either through the assistance of a mediator or retained attorneys, but realistically, your involvement in the construction of this document is simply a formality in both approving the language as written and signing the Order. Nevertheless, it is important for both you and your spouse to know your options under the plan subject to division, so that the alternate payee spouse can be privy to the benefits that he/she is entitled to upon the plan’s division. And so, if there is one piece of advice that I can leave you with in regards to the QDRO, I would simply suggest that you leave this portion of the divorce process to the professionals. There is just too much at stake to lose if this complicated process is not otherwise completed in a competent manner.